“It is fantastic news that former France under-21 international Vincent Pericard has become the latest role-model to pledge his support to the campaign." Show Racism the Red Card (SRtRC) is proud to announce that former Juventus, Portsmouth and Stoke City striker Vincent Pericard has agreed to become the campaign’s latest Honorary Patron. Vincent joins a group of current and former players which includes Viv Anderson, John Barnes, Gary Lineker, Hope Powell and Rio Ferdinand. 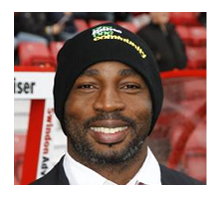 SRtRC uses the high profile of professional footballers to talk to young people about racism. Role-models can have a tremendously positive impact on the attitudes of young people to this issue. Since retiring from football Vincent has set up a company called Elite Welfare Management, which aims to assist with the welfare of professional footballers and their families. Chief Executive of SRtRC, Ged Grebby said: “It is fantastic news that former France under-21 international Vincent Pericard has become the latest role-model to pledge his support to the campaign. We ask our Honorary Patrons to attend at least one educational event each season. “Vincent has already attended an event for young people at Stoke City this season and I know from the staff that his answers to young people’s questions on racism were first rate and from the heart.